Anti-government demonstrator’s chant slogans against the government during a protest in Caracas, Venezuela, Thursday, Feb. 12, 2015. Venezuela’s democratic space is drastically deteriorating. 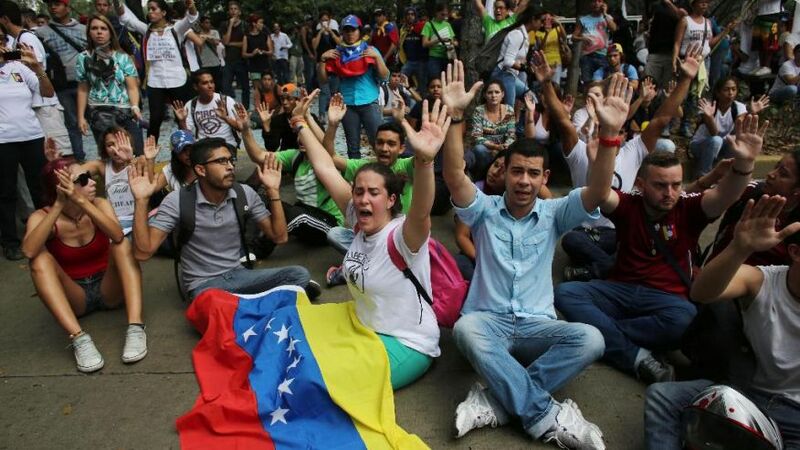 Mass protests in early 2014 indicated the high level of frustration among the Venezuelan people. Citizens expressed concerns over soaring prices, shortage of basic products, and ongoing abuses by security forces. The protests resulted in over 3,500 arrests, including more than 300 minors, according to Foro Penal Venezolano’s report. Today, more than 30 are still detained, while about 2,000 have been given conditional release. Various media reported the deaths of more than 42 people. With a large bounty of rich natural resources, particularly with the rise of oil prices in the past years, the Venezuelan government introduced a “social investment” program, which resulted in better school systems in poor communities, decreased infant and child mortality, and improved access to potable water and sanitation. However, the country currently suffers from a weakening economy and overdependence on oil revenue for the national budget (approximately 45%). People are also suffering from a politicized military, political polarization, and weakening democratic institutions. Fundamental freedoms, including freedom of peaceful assembly, freedom of association, and freedom of expression, are increasingly limited. Pluralism of political opinion is suppressed, and any expressions critical of the government are severely punished. Read more about Venezuela’s political prisoners and their stories. The international community has spoken out. In October 2014, the UN High Commissioner for Human Rights urged Venezuela to release arbitrarily detained protesters and politicians. In November 2014, the United Nations Committee against Torture presented cases of torture that took place between 2002 and 2014. The Committee expressed “alarm” over the reports of abuse by Venezuelan authorities during the 2014 Venezuelan protests, and demanded that Venezuela immediately release “everyone who has been arbitrarily detained for exercising their right to express themselves and protest peacefully.” The Committee also called for more thorough investigations by the Venezuelan government of the 185 abuses of protesters, of which only 5 have been officially charged. In December 2014, the United States adopted the Venezuela Defense of Human Rights and Civil Society Act of 2014 to impose targeted sanctions on Venezuelan individuals responsible for human rights violations as a result of the 2014 Venezuelan protests. With this law, the US government has frozen assets and revoked visas of several Venezuelan senior officials connected to human rights abuses in Venezuela. On February 20, 2015, the Union of South American Nations (UNASUR), which the Venezuelan government helped create in 2008, also condemned the grave human rights violations committed by the Venezuelan government against political opponents and protesters. Today, Venezuela still has more than 100 political prisoners. Many of them face charges with no proof or evidence or have had the benefit of due processes.